It is safe to say that I like different types of music; growing up in a family where musical tastes were extremely diverse, from Eighties pop to Green Day, Rave to Michael Jackson, I came to appreciate various sounds and different styles, and even though Japanese music is the most prominent sound in my system as of right now, I still enjoy different kinds of music no matter its country of origin, or who sings it - if I enjoy it, then I can appreciate it no matter what. For me and many others, Music is Universal. And for the American based Japanese pop group 4TE, this is also the case. Breaking down the language barrier and making their 2015 debut, this America-based Japanese pop quartet are ready to take on the New Year and all it has to offer! Are you ready for them, too? 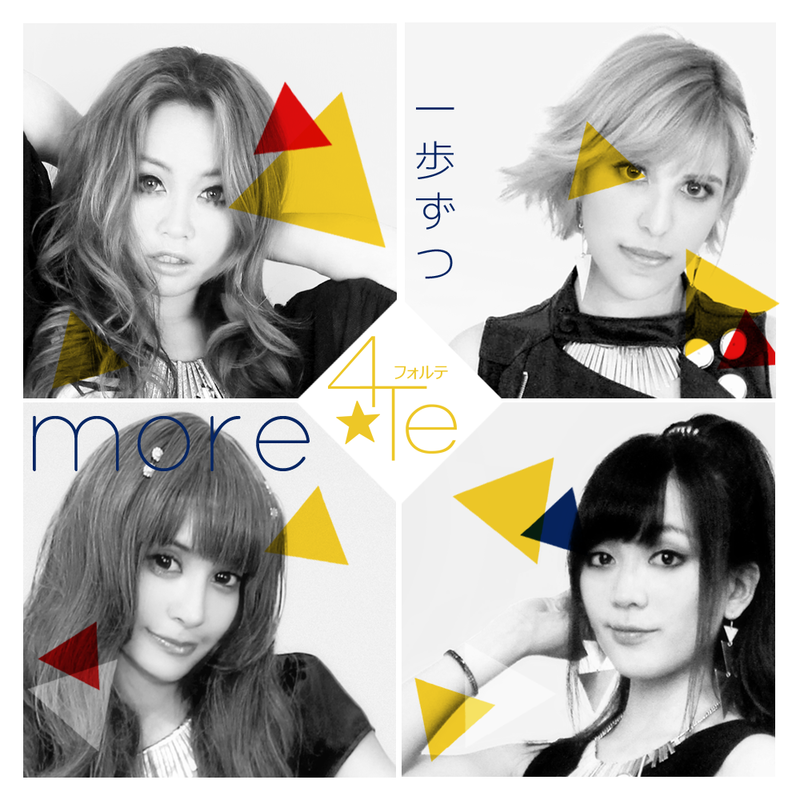 For those curious to know, 4TE (pronounced Forte/for-tay) are a Japanese inspired pop group based in the Southwest of the United States of America, and is made up of four members: Micchi, Jenny, Mei and Chii, who all strive to create, distribute and perform Japanese pop music for everyone to enjoy. Their management team, however, is based in Canada, with both managers aiming to spread the idea of 4TE and what they provide to the industry on an international level. The group, who have been working together for over a year to make their debut Double A-side a reality, have all overcome the obstacles of living in different locations, and hope to reach fans of Japanese music with their sound, all the while using the Internet as a platform to bring not only themselves, but also their dream, together. And so, after all of their hard work and effort, the girls are ready to make their debut this year, sharing with us all their love of music and Japanese pop in the form of their debut single release, MORE / Ippozutsu! Are you ready to become involved in what 4TE have to offer this 2015? Just a day ago I found about 4TE and their debut myself through Jenny, both a member of the group as well as their publicist, who had taken her time to contact me to see that if both I and my readers would be interested in 4TE and what they have to offer musically. Though surprised by the inquiry, I was happy to listen to this new group and to, basically, hear what 4TE were made of - you never know what you could like or what new artists could capture your interest, right? So of course, I listened, ready for what 4TE had created. And yes, I enjoyed what I heard. In fact, I am still enjoying it, and to be completely honest with you, I am rather surprised by how much I really do enjoy this release... it's rather addictive! Now before I get ahead of myself, I want to note that previously, I have listened to other Japanese inspired pop acts that are internet-based, and I have also reviewed them here, too - Beckii Cruel, Oishii! Project and ElectroCute Lightning to name a few - so I do not shy away from acts that are inspired by Japanese pop, because more often than not, they offer pretty good music and are rather entertaining to listen to and view. So, regardless of where they are based, I think that what any artist has to offer can be good, amazing even, especially when it is executed well. Nationality does not make a difference, because as I have said previously, Music is Universal. So with that all said and done, I am now ready to introduce you all to the music of 4TE in review with their debut single release, MORE / Ippozutsu. Once you hear them sing, will you be asking for more? Taking me back to the days where I listened to club music frequently, the first track on the list MORE is an electronic dance tune that is energetic, visual in how it sounds, and enticing. Though it starts off mellow and soothing in sound, this song quickly leads into its catchy, vibrant tone that becomes pretty addictive rather quickly, and will easily find itself stuck in your head even after you have finished listening to it - no matter what, you will won't get rid of MORE too quickly, or ever. Though this track is not my favourite of the two from 4TE's debut release, I still enjoy it quite a lot - I have listened to the song a fair few times, about fifty listens already, and I have yet to find it unappealing or annoying. I suppose that's because, to me, the song is well made; it has wonderful pacing, perfect energy in its tone, and the vocals are wonderful and fit with the instrumental extremely well! Even after all of the vocal editing that possibly went on to create this electronic track, the girls still have a distinct sound that is very appealing, and honestly? I really love their voices and find them addictive to listen to - the vocals are, for me, my favourite part about this track because they all sound so wonderful. As the opening song on this single, I find MORE to be a well-produced, fun and addictive electronic song that is a great opener to what 4TE can do in quality of electronic music, as well as showing off the level of their singing ability both together and solo. Though it is not my favourite of the two tracks present on this Double A-side, I know that MORE is great, and honestly? I really wouldn't mind More of this sort of music in my life if it's like this! The second song present on the the single, titled Ippozutsu, is an Autotune heavy track that is reminiscent of both Perfume and Vocaloid songs in its sound, and is admittedly my favourite of the two. Addictive and catchy much like its predecessor, Ippozutsu has more of a pop sound that feels rather fantasy-like when I hear it, and more like the type of music I listen to on a daily basis. Compared to MORE, this song feels a lot lighter in sound with its cheerful undertones that are welcoming and less serious in tone, and continues to be just as vibrant and enjoyable as the previous track. For fans of Japanese pop and Vocaloid, this choice of tune will be quite recognisable and easy to catch on to thanks to the infectious sound and fun beat. One of the things that I liked about Ippozutsu as a song is that, despite autotune being a prominent effect used within the song, I can still hear how distinct and different the vocals of the girls are in this song - usually, with badly-done autotune especially, I can barely tell one singer from the other, but that isn't the case here with 4TE; the autotune is done well, and though I personally don't know who is singing which line in the song itself, I can still hear the difference between the vocals, and don't mistake the girls for one another, or think they are all singing together when they really aren't. For that, I feel the music producer did a great job on Ippozutsu, because even some of the most professional artists in Japan can't even get this right, at least when it comes to Idols and autotune, that is. Honestly though, despite how I generally don't find myself enjoying autotune or Vocaloid when it comes to my choice of music, I do find this song fun to listen to - I like both songs quite a lot, however I can't deny that Ippozutsu is the one I enjoy the most. It is more pop than dance, which is a part of its appeal to me, and it feels a lot more airy in sound and captures me more as a listener. The fact that I can also tell the girls apart in terms of vocal distinction is a bonus for me, but really, I just enjoy this track a lot! As the second song on the single, I feel that Ippozutsu shows off that fun, innocent side to the girls of 4TE, allowing us to take a look (or a listen!) at a less serious version of the group that MORE had presented us with at the start of the single. It is sweet, playful and a change of pace on the single, showing us a different side to 4TE and what they have to offer, and also my favourite track from this Double A-side release. As a whole, I really enjoyed MORE / Ippozutsu single and what it has to offer. I say this with honesty that, at first, I didn't know what to expect from 4TE after being propositioned to listen to their debut release, nor did I expect to enjoy what they were presenting, however once I had heard their music and how catchy it was, I was pleasantly surprised by how good I found it, and realised I was drawn in by the groups sound and how lovely their vocals were. Really, all four girls are amazing singers, and I love that they each have distinct, well-rounded voices that fit perfectly with the instrumental tracks, as well as together. I really enjoy both MORE and Ippozutsu as songs, especially when I listen to them one after the other, and they are great songs in their own rights. The level of quality is amazing, in both how the sound of the song is constructed and the vocals, and together they are wonderful, enjoyable creations that are addictive and fun, and above all, extremely professional. If I had listened to this on the off-chance without knowing that the group was based in America, or that they are using the Internet as a platform to promote themselves, I would think that this group was legitimately Japanese and that they were under a professional record company - they are that good, and they are, in my opinion, a quality group, one that we should watch out for this 2015. MORE / Ippozutsu is a wonderful debut release from 4TE, one that I am very grateful to have been given a chance to listen to and review. Though the group is based in the United States, they have proven that they can sing in Japanese and create music that is on par with that of Perfume, Vocaloid and many other groups. For 2015, 4TE is a group that we need to watch out for, and I honestly can't wait to see what else they bring forward in terms of music! If you are interested in learning more about 4TE, be sure to check out their Official Website, Official Facebook Page, English Twitter and their Youtube channel!